Over a year ago I shared the vintage keys from our house in Ireland. 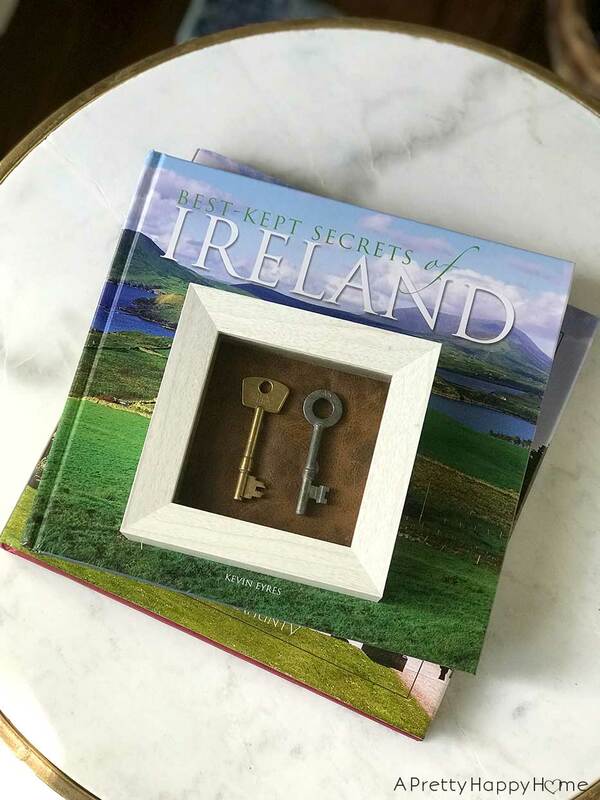 Yes, the doors of our Irish home actually opened with vintage-looking keys. It was super cool and also a wee bit tricky to get in the house. The reason I have those vintage keys now is not that I kept a set when we moved back to the United States. I can’t speak for Handy Husband though. It’s that the doors to the home were replaced while we lived there and those keys no longer worked. I thought they would be the neatest memento of our time living in Ireland. While taking a therapeutic stroll through HomeGoods the other day, I found a tiny shadowbox frame for $3.99. I knew it would be perfect for my vintage keys! Do you recognize what else is in that above photo? That’s right. 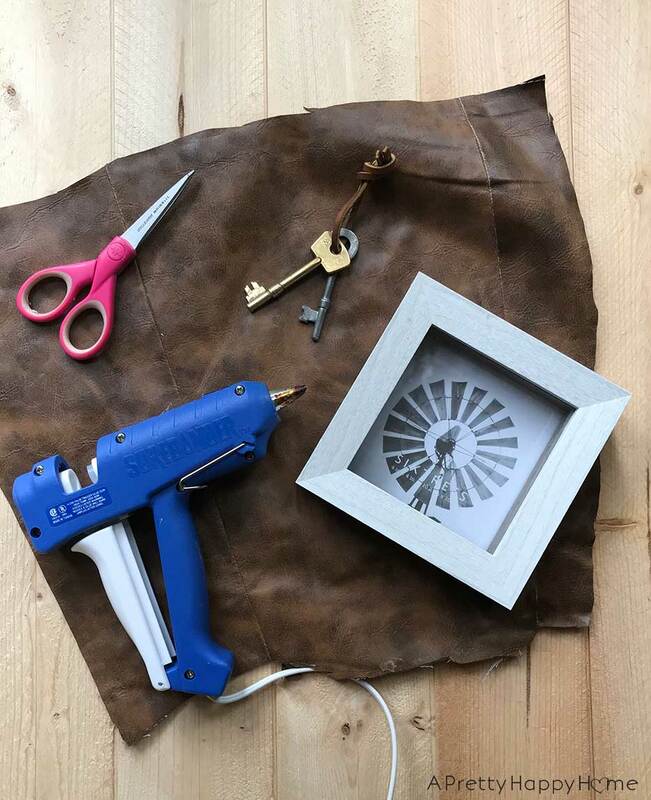 I found ANOTHER way to incorporate the leather from my old pair of favorite boots into a project! If you read that sentence while imagining me doing a fist pump, you would be correct about my level of enthusiasm. Can’t stop! Won’t Stop! Until I’m out of leather. I cut the leather to size to fit in the shadowbox. I hot glued the leather to the back of the frame and then the keys to the leather. This project took all of 5 minutes, but it was SO satisfying. The shadowbox is not going to stay artfully arranged on this stack of books from Ireland, which coincidentally, were given to me as a goodbye gift from our landlord. Inside the first book I tucked the card she wrote to us telling us how much we’d be missed and wishing us all the best on our move back to the U.S.
I’m not crying at how sweet this woman is, you’re crying! The keys are going to be a part of a gallery wall I’m working on right now. 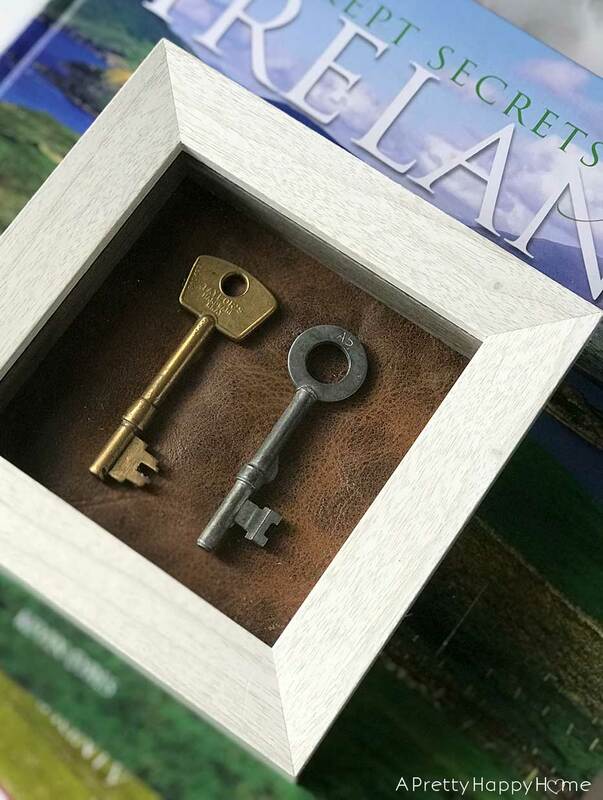 These keys represent not just a physical stop on our journey. They represent the courage it took for us to move to Ireland and the courage to leave behind the people and places we’d come to love to move back home. These keys remind me to try to be more like my landlord who demonstrated kindness in a way I have seldom experienced in my life. The keys also remind me that I CAN finish a project! It might take me well over a year to do so, but by golly I will happily gloss over that fact and celebrate getting it done! Finally. While the books in this post were purchased in Ireland, they are available on Amazon (of course!) and make great gift books. If you’re planning a trip to Ireland they definitely would inspire you! Oh, and I like leather that doesn’t come from cutting up a pair of old boots too.